Sometimes it’s quite cool in the night down under here because it’s still in winter. While I baked this dish, Steak & Red Wine Casserole, the whole kitchen was warm up. What a comfort food that ties our family together we enjoyed. While enjoying this yummy dish, we're chatting over trivial and interesting things we have come across in the day. Our family especially likes the steak casserole going with mashed potatoes! Preheat oven to 180C (356F). Lightly coat beef with flour, shaking off any excess. Heat half of butter and half of oil in a frying pan or flameproof casserole pan on medium, until sizzling. 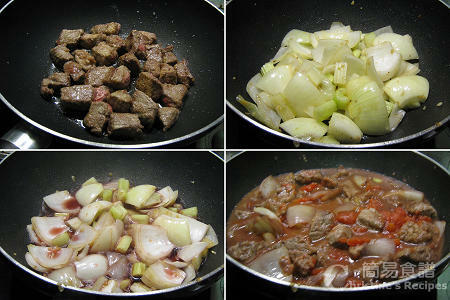 Cook beef in batches for 2 minutes each side, until browned. Remove from pan. Heat remaining oil in same pan on medium. Sauté onion and garlic until aromatic. Add celery and cook for 8-10 minutes, until golden. Add tomato paste. Increase heat to high. Add wine and simmer for 1-2 minutes, until reduced by half. Toss beef back to pan. Stir in tomato and 1 cup of water. Bring to boil. Transfer to casserole, cover and bake for about 1 hour, stirring after 30 minutes. Uncover and bake for another 15-20 minutes, until sauce thickens. Season with salt, sugar and Worcestershire sauce to taste. Meanwhile, cover potato with cold, salted water. Bring to boil and cook for 10-15 minutes, until tender. Drain well. Mash with butter and milk. Sprinkle salt and pepper to taste. Stir parsley into casserole. Serve with mash. ooo looks really delicious! Love casseroles with red wine...so flavourful! Christine, what a delightful & comforting meal this is!! We also enjoy our family bonding during meal time. Your casserole looks so flavourful. 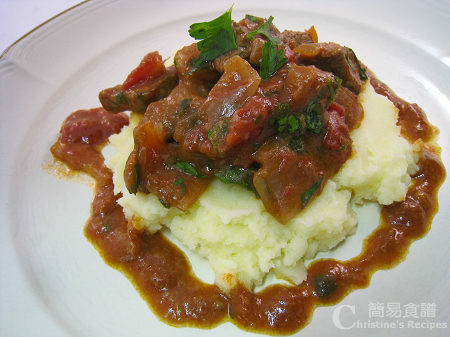 A great comfort dish for winter! that looks so mouth-watering. Thx for the recipe and showing step by step. BTW, I was not able to leave any comments on your blog. Thanks. 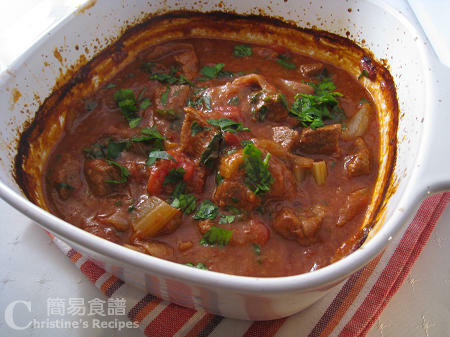 Stews are always on our dinner table in winters. I also like to warm up my kitchen in winters. That's why I always bake casserole. It's easy to cook as well. hi Christine, you said bake for 1 hr but didnt mention temperature? thank you. Hi in Method step 1, prepare oven to 180C (356F). That's the temperature we use to bake.